In the last few weeks our warehouse has been infiltrated by all things mushroom. You already love both the dried and IQF French Porcini Mushrooms, our wonderful local Oyster Mushrooms from Hidden Farm in Minnesota, black and white truffles in every form imaginable… Here’s a look at the new stuff that has our mouths watering. Give us a call for pricing on these mushrooms, or on black or white fresh truffles. Happy eating! This mushroom is found in woods in North America, Europe, Japan and Korea. It is most commonly found growing under beech, oak or other broad-leaved trees, especially in moss in moist spots on heavy calcareous soil. It’s growing season is from June to November. 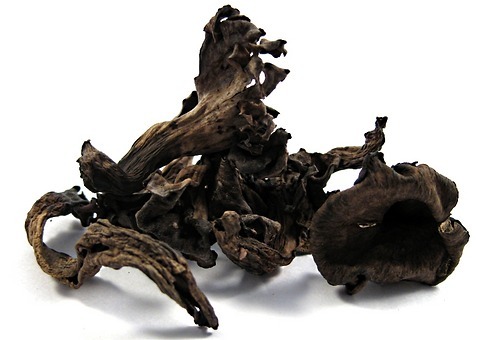 Matsatuke is the common name for a highly sought after mycorrhizal mushroom that grows in Asia, Europe, and North America. It is prized by the Japanese and Chinese for its distinct spicy-aromatic odor. Matsutake grow under trees and are usually concealed under fallen leaves and duff on the forest floor. It forms a symbiotic relationship with the roots of a limited number of tree species. 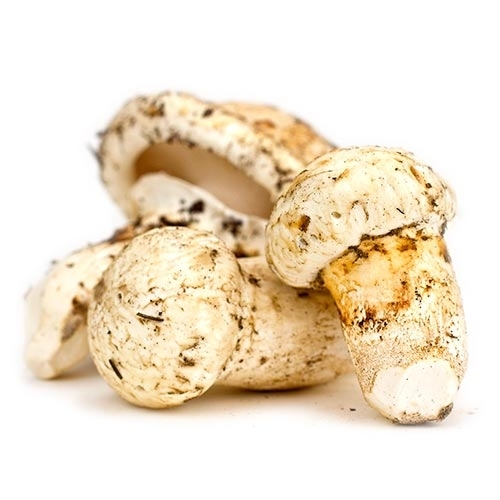 Matsutake are known to grow in China, Japan, Korea, Canada, Finland, the United States, Sweden, among other countries. Lobster mushrooms are not a mushroom, but rather a parasite that overtakes forest mushrooms, turning them a reddish orange color that resembles the outer shell of a cooked lobster. It can be found on members of the Milk-Cap and russala family. At maturity, H. lactifluorum thoroughly covers its host, rendering it unidentifiable. 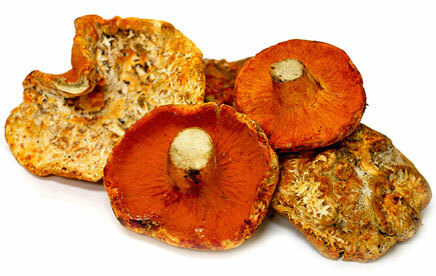 Lobster mushrooms are widely eaten and enjoyed. They have a seafood-like flavor and a firm, dense texture. To finish the triptych on truffles, I will relay what I learned from Luigi about ripeness. As I said last week, the shape of a truffle has little to do with the maturity or the ripeness. A truffle will realize its full size in 2-3 days, but the ripening process can take anywhere from 2-4 weeks. The indicator is the aroma, and when we opened up the package of truffles this past week, over one pound of melanosporum, it smelled really good. As the truffles are growing underground it is difficult to know where they are or when they are ripe; this is where the dogs come in handy. A hunter and his/her dog may walk past a truffle at 4am, without a whiff, but walk by again at 6am and the dog will poke its head into the soil and start digging. The danger is that this happens at some point and a deer or wild boar passes by, which is good eating for them and bad luck for the truffle hunter. Once the truffles are out of the ground the determining their quality is a bit easier. Both the black and the white should be fairly firm when squeezed, just a bit of give is good and not hard like a rock. The blacks should not have too many white veins throughout, as these are “blank space,” the black portion representing the spores. The aroma of the black is not readily apparent when raw, unless you have a large quantity. The white truffles make their presence known immediately. Once a cook came to me with a panicky look in his eye, “I think we have an electrical fire!” One truffle will stink up the whole kitchen, in a good way. We have learned that collection is 40% down from last year. Orders placed Monday morning are available for Thursday delivery. As Luigi explained to me, with great enthusiasm, mushrooms are amazing! There are three types of mushroom: the pathonogenic, the saprophyte, and the symbiotic. The pathonogenic, kill the host and generally are not edible. The saprophyte mushrooms feed on decay; they digest the medium on which they grow. These mushrooms can be farmed in man made medium, they are oyster, crimini or shittake mushrooms. The symbiotic mushrooms benefit both the host and the fungus, and the ecology of the relationship has proven too complicated to replicate, think TRUFFLES! I asked Luigi about the size of a truffle and how it relates to its ripeness. He said, “a truffles size is dictated by the nutrients and density of the soil not the ripeness.” A truffle realizes its innate girth through a combination of the available nutrients and the density of the soil, within two days. The varieties of soil range from loamy nutrient rich soils, to dense stone filled soil. 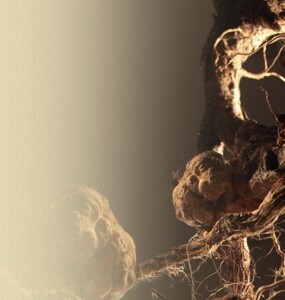 In every case there are tree roots and mycelia in a symbiotic and somewhat magical relationship. It is time that determines maturity and it takes, approximately, two weeks for a truffle once formed to fully mature. 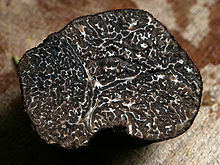 The shape of a truffle has little to do with the aroma, though it can be an indicator of the intensity of the truffle. In fact, as with many things, the perfect shape does not mean the best flavor. A perfectly egg shaped truffle often has less aroma than one with funky shapes. An egg shaped truffle usually forms high up in the soil, sometimes cresting above the soil. As we looked at truffles picked in the previous week, Luigi pointed out the outlines of roots and rock faces that the truffles had grown up against. 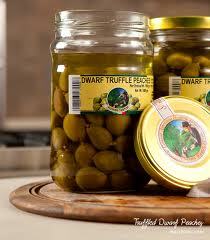 He traced the lines with reverence and described the forces at work and the resilience of the truffles. We have learned that collection is 40% down from last year. Experience says, order the week before New Years for the best price, but we will be able to get them the week of if needed. Orders placed Monday morning are available for Thursday delivery. Pupa – The Laggoto Romagno truffle hunter Straordinario! There are so many things to know about finding truffles and most if the information rests with people. It is a tradition passed along from person to person. I remember clearly a friend, who wanted to go hunt mushrooms with me, on a specific date and at a specific time. She was busy and she knew that I had found a good number of mushrooms. When I tried to explain that there were as many days, or more, that I found no mushrooms and that the chances of us finding any mushrooms on September 8th at six in the morning were not good; she was confused. I got a similar explanation from Luigi, Adrianno and Pupa, but soon we were all on the same page. We spent our time in the woods talking about the tradition of truffle hunting and the magic, the mystery and the passion that we all shared for these elusive gems. For the next few weeks, at least, we will try to cover much of what we talked about. 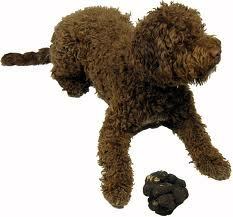 It might be fun to just talk about Pupa (Babe), a cute dog from a breed commonly used to hunt truffles; the Lagotto Romagno. What determines the size of a truffle? Why are these dogs so amazing? How to best extract the aromas to oil? Stay tuned and start thinking about how you want to use truffles this holiday season. Folks have been calling for truffles and they are available, summer truffle season is just finishing, while winter and white truffles are just starting. Pricing is determined Sunday morning each week to provide estimates for the following week, click here for the order form. The intense ar oma and flavor of the truffle captivate the palate; its aphrodisiac qualities add to its allure as a food that delights the senses. To the nose the black truffles have the wholly unique smell of truffle, musky and mushroomy, and on the palate the taste is variable; they have a slightly bitter note finishing with a delicate hazelnut flavor. 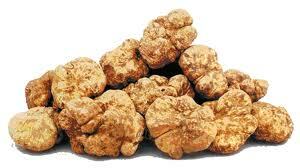 The white truffle has a more delicate alium/floral aroma that is best in raw preparations. The “black truffle” or “black Périgord truffle” (Tuber melanosporum) is named after the Perigord region in France and grows exclusively with oak trees. Production is almost exclusively European, with France accounting for 45%, Spain 35%, Italy 20% The “white truffle” or “Alba madonna” (Tuber magnatum) is harvested from October through January, it comes from the Langhe area of the Piedmont region in northern Italy and, most famously, in the countryside around the city of Alba. There are two species of summer truffle: burgundy truffles (tuber uncinatum), harvested in autumn until December, and summer truffles (tuber aestivum), and tuber aestivum are still available. 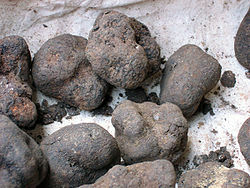 Black truffles are dark brown to black at maturity with numerous white veins. The intense aroma and flavor of the truffle totally captivate the palate, its aphrodisiac qualities add to its allure as a food that delights the senses. To the nose they have the wholly unique smell of truffle, musky and mushroomy, and on the palate the taste is variable; they have a slightly bitter note finishing with a delicate hazelnut flavor. There are two species of truffle available from May through December: tuber aestivum, the common summer truffle, harvested from May until September and tuber uncinatum a.k.a. burgundy truffle, harvested from September until December. Both of these truffle species are paler color and have a more subtle aroma than the winter truffle (tuber melanosporum).